Q. What’s your niche in Testing & Flow measurement? The accuracy of fluid flow plays a very vital role in industry and in fact the single largest measurement parameter which is decisive in the quality and quantity of products. Hence, having a national standard for fluid flow is of high priority. The very purpose of establishing FCRI by Govt. of India was to create a facility that would provide a standard for flow measurement in air, water and oil flow media. The impeccable infrastructure and well experienced manpower available at FCRI make it a natural contender for National Measurement Institute / Designated Institute, for fluid flow parameters in air, oil and water media. Designating FCRI for Fluid Flow parameter will be an extension of existing recognitions, such as NABL, BIS, DST, etc. Q. What makes you the much sought-after testing lab in India? FCRI has the best uncertainties in flow measurement in our country whether it is oil /air / water medium. Constant up-gradation of facilities to keep FCRI at par with other world-class facilities by constantly proving its International credibility through Inter-comparisons with other similar facilities. It is also improving tie-ups with reputed educational institutions in the country for enhancing research outputs. Q. What are your unique facilities? Flow laboratories with uncertainties comparable and in some cases better than International facilities. The uncertainties start from 0.02%. It has developed a unique valve cavitation research centre for the use of process industry where you can test valves for their performance and effectiveness under cavitating conditions. In-situ flow measurement is very difficult to do in large pipe-lines at site. FCRI is focusing on this area using various methods like tracer dilution method with non-radioactive dye injection, clamp on ultrasonic flow meter, insertion type flow meters, etc. NABL [National Accreditation Board for testing and calibration Laboratories] – under ISO 17025 norms for calibration and testing of fluid flow products. DST [Dept. of Science & Technology] – As R&D INSTITUTE in Fluid Flow Measurement. IFE [Institution of Fire Engineers, New Delhi] – For Hydraulic qualification tests on firefighting equipment. Nuclear Power Corporation of India Limited – For seismic analysis of Power plant equipment. Q. What puts you on the global map? More than 250 delegates (Both National and International ) have participated in each of these conferences .These conferences have helped FCRI to gain International reputation. FCRI has been conducting International courses. More than 1000 participants from 90 different countries have attended FCRI’s courses so far. Q. What’s your contribution to enhancement of quality and accuracy in flow measurement? Maintaining and constantly improving flow measurement standards to the best uncertainty is a colossal task, considering the complexity involved in the flow measurement standards. FCRI has been doing this task commendably well. Our customers (more than 4000) will vouch for it. You take any major Indian industry (whether private /public sector), they are FCRI’s customers. They look at FCRI for lasting solutions for their flow measurement problems. FCRI has initiated a Fow Measurement Group which will concentrate on exchange of ideas and solutions in this area. This was initiated during a parallel session in the last concluded International conference. 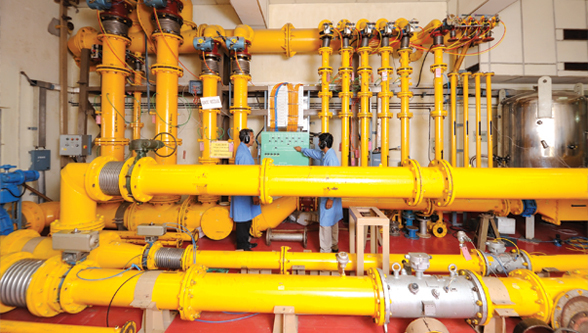 Imparting training to Indian industry in the flow measurement and control field is another major contribution.